So The Bullet-Catcher's Daughter was a bit of a surprise as I enjoyed it more than I thought I would and in a very good way. It was steampunk without getting overly lost in it being steampunk. It was clever and witty and a nice spin on a detective drama, but a little light on the investigation site for my tastes. Unseemly Science continues this very ominously-named trilogy of Fall of the Gas-Lit Empire and the first book didn't seem to touch on how things were going to be taken down. And so I hoped that this book would tackle that a bit more and help explain why the series is called that. But alas, it's still not there. What we get instead is another adventue with our daring protagonist in a world that is technologically backwards compared to our own yet particularly cultured in its own right. I like the complexity of her character at times and the lengths she'll go to get things done. And her expanding cast of characters is an interesting one that also gets a bit more development this time around. But again things fall just a little bit short. Synopsis: Unseemly Science is the second book in Rod Duncan's Fall of the Gas-Lit Empire trilogy. Disclosure: I initially received a free advanced reading copy (ARC) of this book through NetGalley in exchange for my honest opinion of the work. But I eventually bought a Kindle copy of the book and this review is based on the final text and not the ARC. So our information gatherer / detective protagonist Elizabeth Barnabus continues to do her best to make money by posing as her fictional brother. One of the who knows of her double life is Julia, who has recently becomed more and more enamored with this charitable organization that claims to be giving women a greater purpose in life through service and charity. But now that Elizabeth looks at things, something doesn't feel quite right about the group's leader. But more importantly it seems that legislation is going to be passed that will allow for the extradition of criminals of the Kingdom, something that will certainly complicate things as Elizabeth is still assumed to be the slave of a Duke in exchange for debts he had maneuvered her father into needing to settle sooner than they should have been. How she'll continue her own investigation on top of trying to avoid being pulled back to the Kingdom is what ends up defining the story. What I Liked: Elizabeth remains to be a rather strong character and she has a lot of great moments in this book as she continues to be brilliantly her. But at the same time she isn't perfect and more than once she's caught unawares or at least outmaneuvered by those who would challenge her. And this balance really worked out. I was initially surprised to see Tinker become a character of more prominence in this story and a bit more important than in the last one. But despite his lack of dialog, he's quite the endearing character who has an odd charm of his own that Duncan is able to convey well enough in his writing. And I really liked how tecnology really did end up plaing a bigger role in this book versus the last one. Yes the first book had a particular device featured well as part of the circus act but this second book did well to push things further with its resolution. What Could Have Been Better: To some degree it felt that Elizabeth had a lot less agency in this book as events sort of swept her own ranging from the extradition treaty with the Kingdom to even te casse" that she ends up investigating as the core of this story. Circumstances end up pushing her around and while how she deals with things is quite admirable but I'd like for her to go more on the "offensive" as it were. 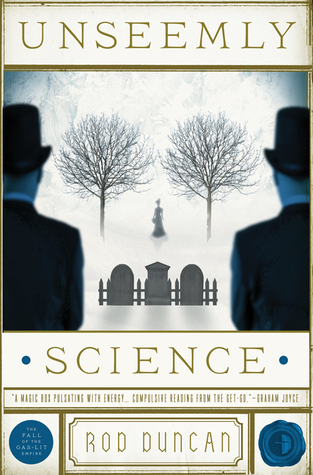 TL;DR: Unseemly Science is a good enough book on its own but as a part of a series it doesn't automatically feel like it's moving things forward. It has strong characters but it's not always clear if they're being employed to the best of their abililties, and that feels like a waste. Thus the book gets a decent 3.5 cases being investigated by the International Patent Office out of a possible 5.